If you've ever written anything for publication, you know how far in advance you have to work. There are planning sessions, revisions, discussions, more revisions, and after much work the final product emerges. The same goes for crafting the Chemical Processing Panel Discussion series. Our editorial team, in concert with our business team, took great care in deciding what topics to cover in this monthly series. We will examine solutions and provide guidance on how plants can make the most of their energy resources. This webinar will offer advice on how to improve operations, optimize efficiencies, lengthen asset life and boost overall reliability. 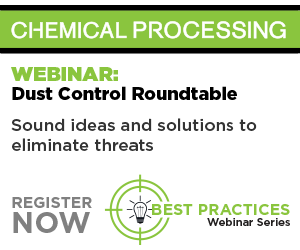 Experts will address the challenge of staying in compliance with current regulations, how to detect security gaps in plant systems and how to properly design systems and applications to prevent attacks. Speakers will provide practical pointers for optimizing asset use, improving efficiency and lowering maintenance costs. Panelists will examine the best ways for minimizing and controlling emissions as well as for maintaining regulatory compliance. Most plants have too many alarms, hampering operators’ ability to properly respond to abnormal situations. This discussion will look at ways to tackle alarm overload. Panelists will review the conditions that are required for dust explosions to occur and present approaches to spot and address dust cloud explosion hazards. It’s crucial to implement processes to detect and prevent hazards from occurring. Panelists will offer advice on the best ways to identify and handle risks. Panelists will discuss solutions for improving wastewater treatment to enable increased water recycling and decreased discharges. With energy representing a substantial portion of plant costs, improving energy efficiency is a top priority in the chemical industry. Learn how to take fullest advantage of energy resources. This panel discussion will examine issues related to characterizing solids – and handling them during processing. We will examine regulations and standards that target dust and dust collection systems and explore the best ways to deal with potentially explosive dusts to cut explosion and fire risks. Traci Purdum is Chemical Procesisng's Senior Digital Editor. She is also the moderator for the webinar series. You can e-mail her at tpurdum@putman.net.